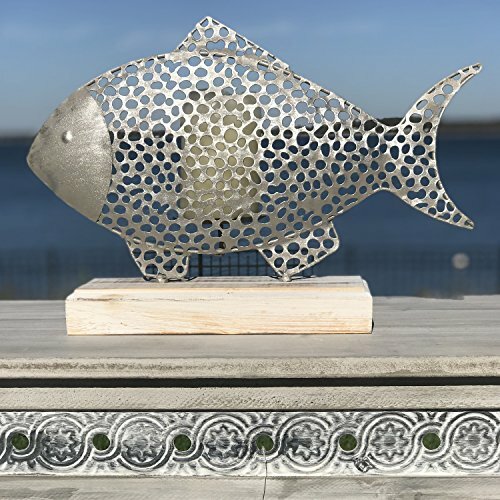 BY LAND OR BY SEA, inspire amazing evenings full of magical ambiance with the sculptural Cape Cod Fish Candle Holder. Set your own lighted candle into the spiked candle dish of this sculptural piece to inspire welcoming and romantic lights. Cast beautiful shadows through its scaled body that is depicted of open metal work. ARTISAN CRAFTED BY HAND this piece is made of polished and brushed silver iron and mounted on a block shaped base of white stained pine that has been finished with a shabby finish. WELL SIZED this piece measures as follows: 15 ¾ L x 5 W x 10 ½ H inches. The lightly stained base features an elegant bevel and is 1 1/2 inches thick. Ideal for 2 3/4 inch diameter x 4 inches tall votive or pillar candles. VERSATILE Designed to pair with a variety of themes ranging from coastal to mountain, this fish is ideal for use in any room of the house. Especially versatile, this piece is well suited for creating a mantel or dynamic table top centerpiece. AN IDEAL GIFT, it's perfect to celebrate holidays, birthdays, weddings and many more. So gorgeous, you'll want to keep it at home for yourself. Enjoy! By Whole House Worlds Welcome to the product line of Whole House Worlds. The New York based company offers high quality, stylish products for every room in the house, and beyond. From the kitchen, to the living room, to the bedroom, dining room, home office, closet and garden: Our criteria are comfort, quality, style and value. BY LAND OR BY SEA, inspire amazing evenings full of magical ambiance with the sculptural Cape Cod Fish Candle Holder. Set your own lighted candle into the spiked candle dish of this sculptural piece to inspire welcoming and romantic lights. Cast beautiful shadows through its scaled body that is depicted of open metal work. ARTISAN CRAFTED BY HAND this piece is made of polished and brushed silver iron and mounted on a block shaped base of white stained pine that has been finished with a shabby finish. WELL SIZED this piece measures as follows: 15 ¾ L x 5 W x 10 ½ H inches. The lightly stained base features an elegant bevel and is 1 1/2 inches thick. Ideal for 2 3/4 inch diameter x 4 inches tall votive or pillar candles. VERSATILE Designed to pair with a variety of themes ranging from coastal to mountain, this fish is ideal for use in any room of the house. Especially versatile, this piece is well suited for creating a mantel or dynamic table top centerpiece.